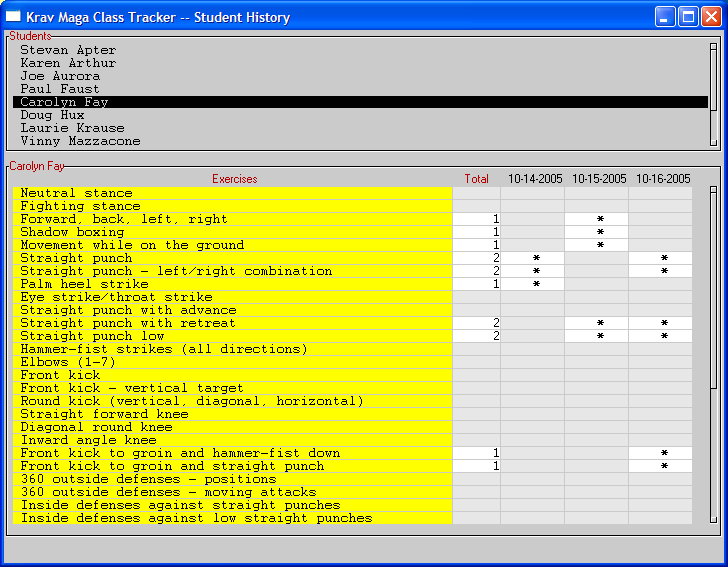 The Krav Maga Class Tracker is used to design, create, edit, and query Krav Maga classes. Download the software here. Follow the instructions in the Readme document. 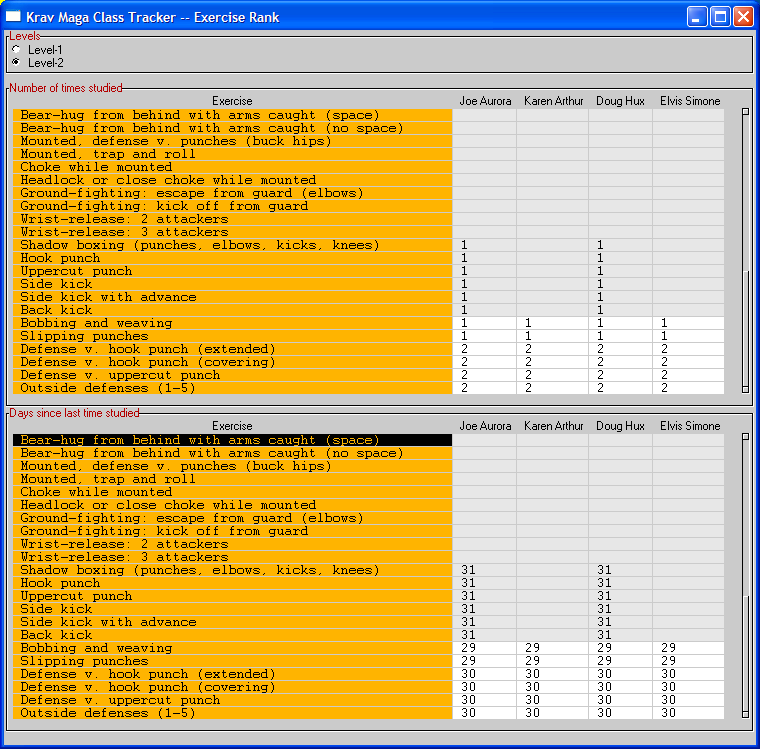 One or more levels may be set for a class. This has the effect of restricting the lists of students, exercises, and instructors. For example, if levels 1 and 2 are selected, the user will see only level 1 and 2 students, only level 1 and 2 exercises, and only those instructors qualified to teach levels 1 and 2. There are six component lists. An element is added to or removed from the current class definition by double-clicking on it. A student consists of a first name, last name, and level. An exercise consists of an exercise code and an exercise description. The exercise code has two parts: a belt-color and the two-part code as it specified in the official Krav Maga curriculum. An instructor consists of a first name, last name, and level-instruction qualification. Dates extend 30 days into the past (relative to the current date) and 90 days into the future. Times are on the quarter hour. A class has one or more instructors, a location, a date, and a time. Properties are added to or removed from a class by double-clicking on the corresponding item of a Components list. A class is a table of students by exercises. Students and exercises are added to or removed from the current class by double-clicking in the corresponding Components list. By default, all level k exercises are assigned to all students at level k. Any exercise can be assigned to, or unassigned from, any student, by clicking on the corresponding table cell. An instructor's note can be saved with the class definition. Clicking on a (red) label displays quick help in the status line at the bottom of the window. New creates a new class-definition. Open prompts the user for a class-definition file to open. Print prompts the user for a class-definition file to print. 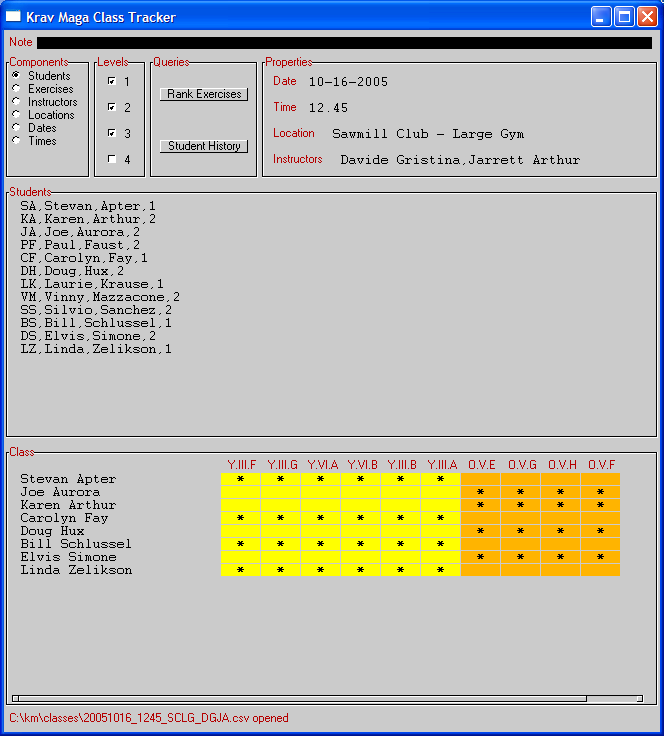 About displays authorship information about the Krav Maga Class Tracker. Exit exits from the Class Tracker. Data is displayed with white background if the current class assigns the corresponding student-exercise combination. Double-clicking on an exercise in the query display adds that exercise to the current class, or removes it if it is present. Copyright (c) 2005, Stevan Apter. All Rights Reserved.